The Salerno Two tone offers the same style of bed as the Salerno stone white frame but with one exception the top rail on the headboard are a varnished solid oak to give this bed frame a different look . Salerno two tone is one of three new beds from Julian Bowen and is supplied in single, double and king size and comes with a sprung slatted base . Please note the gap between the slats is 8cm so we do not recomend purchasing this frame if you have a turnable pocket spring mattress. 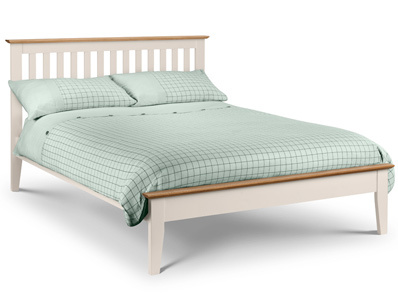 This bed frame will be delivered direct from Julian bowen on his own dedicated home delivery team. normally within 7-10 working days to most postcodes free of charge . Some postcodes will take longer and may incur a small delivery charge.